3. Meanwhile, melt butter over medium heat in a large frying pan. Cook and stir mushrooms and shallot in butter until tender. Remove from pan. Add shrimp and cook until shrimp turn pink, about 2 to 3 minutes. Removed from pan. add 2/3 cup chicken broth to pan and bring to a boil. Cook, uncovered, until reduced to 1/4 cup (2 to 3 minutes). 4. In a small bowl, stir together sour cream and cornstarch; mix in 1 cup of chicken broth. Stir into reduced chicken broth in the pan. Cook and stir until thick and bubbly. Cook 1 minute more. 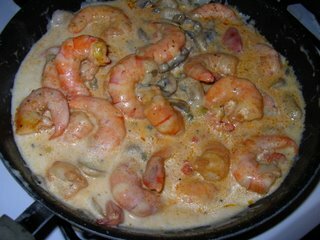 Stir in shrimp, mushroom mixture, roasted red peppers and capers. Heat through and season to taste. Serve over pasta. Thanks to Linda Johnson on AllRecipes.com. Enjoy. Yum yum yum! This looks fantastic. I'm a huge shrimp fan and I have to say that shrimp cocktail is my favourite appetizer! By the way, clearly you are raising your grandson in the proper manner. A 6-year-old who loves brie is clearly a brilliant child! LOL.... I know! His mom is a huge influence on him. I'd feed him hotdogs daily if it were up to me!